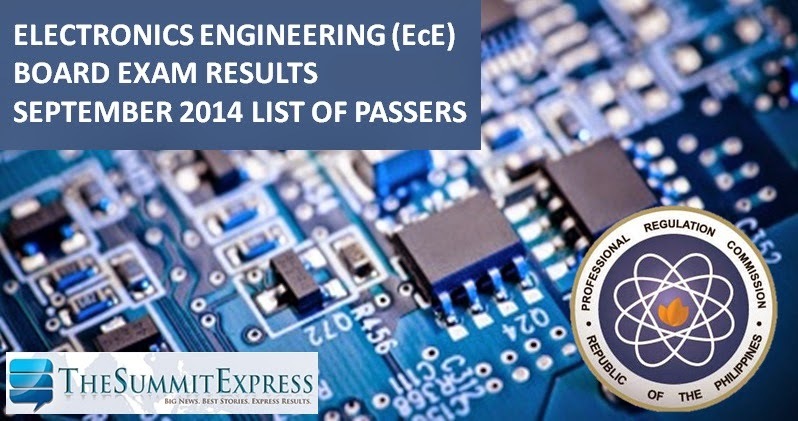 Those awaiting results of September 2014 Electronics Engineering (ECE) and Electronics Technician (ECT) board exam may find here full list of passers, top 10 (topnotchers), top performing and performance of schools as the Professional Regulation Commission (PRC) and Board of Electronics Engineering (BEE) announce results today, October 2, 2014 or in 3 working days after the exam. ECE board exam covers the following subjects: Mathematics, Electronics Engineering, General Engineering and Applied Sciences (GEAS) and Electronics Systems and Technologies (EST) while programs for ECT board include basic math, electronic and electrical equipment, Philippine Electronics Code and Electronics Engineering Law of 2004. In March electronics engineering board exam, results were posted online in three (3) working days after the last day of examinations. A total of 907 out of 2,574 passed the Electronics Engineer Licensure Examination and 969 out of 1,488 passed the Electronics Technician Licensure Examination. University of the Philippines - Diliman (UPD) was the only top performing school for March 2014 and December 2013 Electronics Engineer (ECE) board exam for having 100 percent and 96.67 percent passing rate respectively.